If you'd like an online video-based course on using hand tools, you can take my course Intro To Hand Tools at Popular Woodworking University, the online class website for Popular Woodworking Magazine. A complete episode guide is available here. You can also purchase the parts of the course as individual digital downloads at Popular Woodworking's online store here. Private instruction at Littleton Common Makers, Littleton, MA. Private instruction at your location. Public classes at Cambridge Center For Adult Education, Cambridge, MA. Public classes at Woodcraft of Boston, Woburn, MA. The benefits are a chance to work directly with an instructor and try a variety of tools. However, as an adjunct, I have information here for anyone who'd like to follow along at a distance; look for the Intro Hand Tools heading. This is for those who already know a little bit about hand tools as well as those who know absolutely nothing about them. I'm not an expert or a professional; my goal is to teach people the basics to get started, preparing them for more advanced instruction or self-paced learning. This information is useful whether you want to work exclusively with hand tools, or mix them with power tools. If you're not in the area, or this isn't the instruction you're interested in, take a look at the list of schools on the Links page. If you'd like to teach classes of your own, feel free to use any of the materials or ideas you see here, provided you attribute them to me and CloseGrain.com. Fair use is fair use, but plagiarism is plagiarism, even on the Internet. Also remember that safety is of paramount importance at all times. The format is skills-based, not project-based. Beginners often get too focused on trying to complete a starter project or set impossibly high goals for themselves, and get frustrated when they make mistakes. Instead of trying to build something specific, we'll follow the advice of Ian Kirby and Frank Klaus and practice individual skills. We'll make shavings, sawdust, and chips, with the freedom to make mistakes and learn from them, because it's all going to be thrown out anyway. This approach gives students the skills, experience, and confidence to build projects on their own. It also gives them a method for acquiring new skills. This may seem terribly wasteful, but ya gotta burn some to learn some. This is very hands-on. I bring multiple examples of tools for students to try, and supply rough-milled pine lumber for practice. As an added historical bonus, I get the wood from Parlee Lumber in Littleton, a local mill that's been in operation since 1815, nearly 200 years! I offer private classes in the basics of hand tool woodworking. Topics covered are your choice, on your schedule. There's room for up to 4 people to work if you'd like to bring someone along at a discount. Note that I no longer operate the Close Grain School Of Woodworking in Pepperell, MA. This replaces that venue. 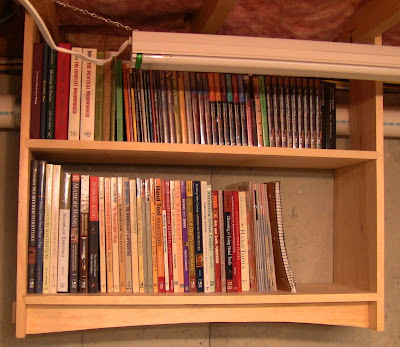 These photos show my old student space in my basement workshop, but I have moved this to Littleton Common Makers. ...and the two right benches. The tool cart with enough tools for 4 people. The plane toes are resting on a strip to elevate their irons off the shelf. 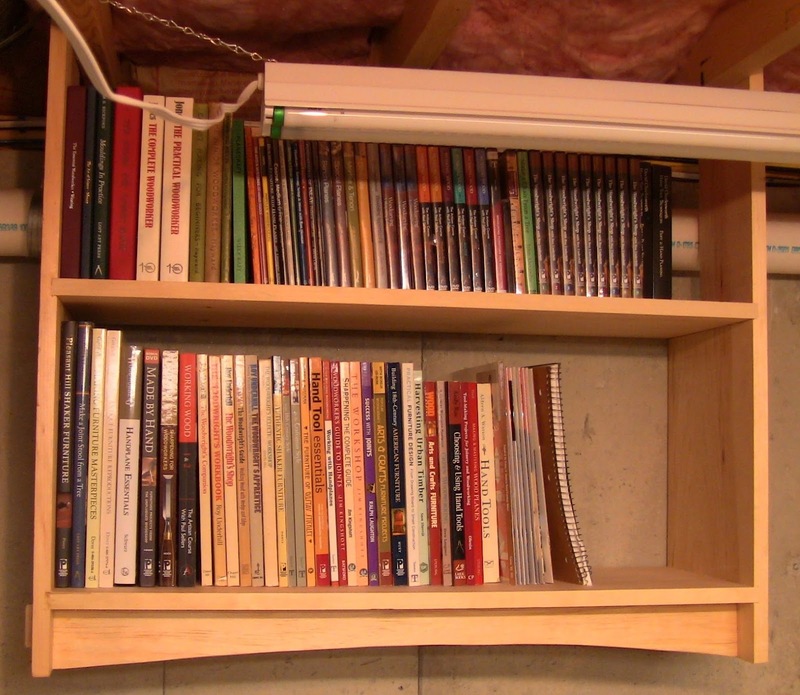 The hanging bookshelf is well-stocked with books and videos. You don't need to know anything starting out, and you don't need to have any tools. I can take you through the whole process of learning the basics. The end result is that you'll be able to make basic furniture and cabinetry projects using a variety of classic joinery methods, either all with hand tools or with a mix of hand and power tools, whatever works best for you. You'll also be ready to take more advanced classes from any of the fine woodworking schools in the Boston metro area if you'd like to further expand your skills. Once you've learned these skills in class, the key is to practice them at home, just like learning to play a musical instrument. Put the time in just making shavings, chips, and sawdust without worrying what it looks like or what mistakes you make, and pretty soon you'll be confident working on real projects. Cost is $30/hour for one person; if you'd like to bring up to 3 other people, each additional person is $15/hour. Materials provided at extra cost, or bring your own. Littleton Common Makers is located in The Littleton Mill, just off Littleton Common, at 410 Great Rd, Littleton, MA, right by the Rt. 119 exit off Interstate 495 (map here). Littleton Common Makers is a membership makerspace with classes open to the public. For woodworking, I have four Paul Sellers workbenches. All necessary tools are provided, ranging from 19th century wooden planes to modern handplanes, or you can bring your own. Do you have some you'd like to learn to use? Are there some you don't have that you'd like to try? Be sure all personal tools are marked for identification. A simple marking method is to put blue painter's tape on a tool and write your initials on it. Payment is due on the date of class in cash or check; a deposit is not required. Classes can be skills-based or project-based. For skills-based, you can follow my standard curriculum below, breaking up the time as necessary, or suggest something different. Spend as much or as little time on a topic as you want. For project-based, you can do small projects entirely in class, or work on techniques needed for a bigger project you're doing elsewhere. At a minimum, I recommend the sharpening class, because without sharp tools, you just can't work. Sharpness is like the gas that makes a car go, and sharpening is the most basic of maintenance skills; just as you need to know how to fill the tank when it's empty, you need to know how to sharpen a tool when it's dull. It's just as easy as filling the tank once you know what to do. Standard Curriculum These 3-hour classes cover the kickstart skills, the basic basics. You can treat this as a linear curriculum or pick and choose specific classes in any order. Once you've acquired these skills, you'll be prepared for more advanced training, on your own or from other instructors. Sharpening: The gateway skill. Plane, chisel, scraper, and saw sharpening, using a variety of abrasives (oilstones, waterstones, sandpaper, diamond plates), freehand and with sharpening guides. Bring some tools to practice on! Read more about this class here. Rough Stock Preparation: Breaking down boards into rough dimensions with handsaws. Includes crosscutting, ripping, and resawing. Read more about this class here. 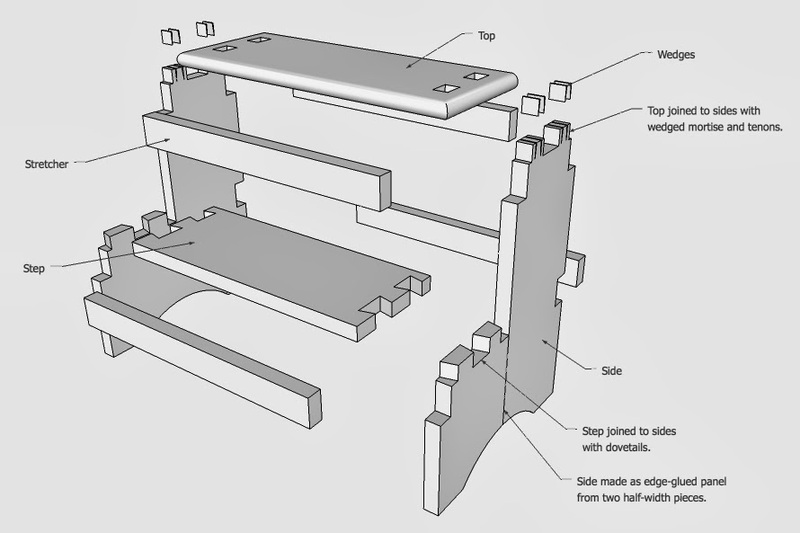 Final Stock Preparation: Final dimensioning of parts previously roughed out with hand or power tools, using saws and handplanes in the FEWTEL sequence. Includes fine sawing, and face, edge, and endgrain planing. Read more about this class here. Simple Joinery: Lap joints, rabbets, dadoes, and grooves. Read more about this class here. Mortise and Tenon: Blind mortise and tenon, through mortise and tenon, and bridle joints, including drawboring. Read more about this class here. Dovetails: Through and blind dovetails. Read more about this class here. Boring and Curves: Boring holes with braces and bits, eggbeater drills, and specialty tools. Forming and refining curves with bowsaws, chisels, spokeshaves, and rasps. Tool Restoration: Restoring old tools, covering handsaws, handplanes, chisels, and specialty tools. Many a dirty and rusty hunk can be restored. Put your old family heirlooms and Internet, flea market, and antique store finds back to use. This is the travel version of private instruction at my workshop, offered on-site at your location, on your schedule, subject to availability. Round-trip driving time, as reported by Google Maps directions, is charged at the same hourly rate as class time, to cover my time and gas. You can check the driving time to your location at Google Maps: Ayer, MA. I'll come to you and bring everything necessary. This can be your home, a community center, a private organization, or any other facility you have permission to use. You're welcome to include additional people at a discount, subject to the practical limitations of the space. The advantage is that you set the agenda. We can follow my outline exactly, or you can pick and choose topics and how much time you want to spend on them. At a minum, I recommend an hour or so of sharpening instruction if you are not already skilled at it, because without it everything else is much harder. Beyond that it's up to you. You don't need to have a big fancy workshop. The minimum requirement is a 4'x6' space that you don't mind getting a little messy, with reasonable access for bringing in tools, portable workbench, and practice lumber. This can be in a basement, garage, shed, spare room, or porch, or I can even bring a portable canopy and setup outside, weather permitting. 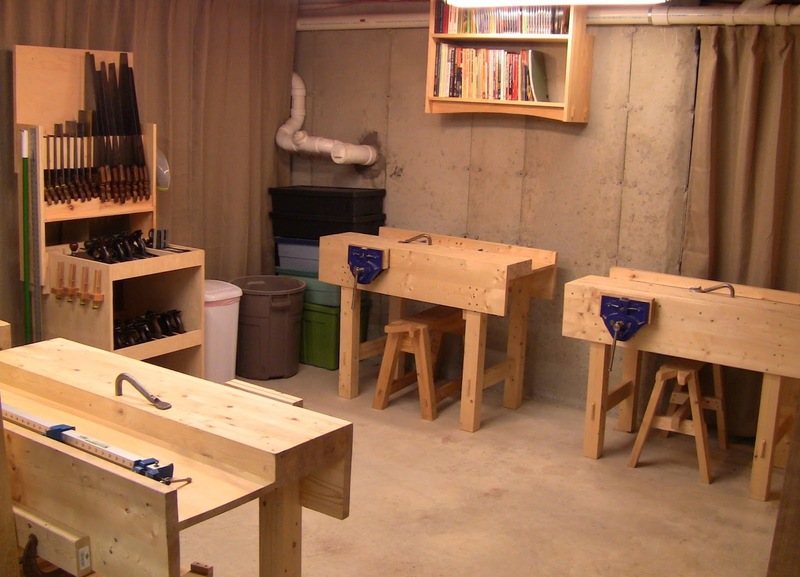 If you have an existing workshop, bench, or tools, we can also use those. I can provide practice lumber sufficient for multiple sessions, or you can provide your own. Cost for hands-on instruction for one person is $35 per hour of class time and round-trip driving time. If you'd like to include up to 3 other people, each additional person is $15 per hour of class time. Materials provided at extra cost, or provide your own. Cost for demonstration-only instruction to groups of any size is $50/hour, including round-trip driving time. Materials provided at extra cost, or provide your own. To schedule sessions, email me at sdbranam@gmail.com, or leave a phone message at 978-772-0030. What specific instruction are you looking for? Do you want to follow my outline listed above, or something different? Do you have all the tools, workbench, practice materials, etc. you need for that instruction, or do you need me to bring them? Even if you have the tools, if you're interested in trying out some different ones, I can bring those. When are good times for you? As a father with a full-time job, I'm generally available evenings during the week and any time weekends, subject to prior commitments. I recommend session length of 2-4 hours at a time if scheduling allows. You don't need to have a particular plan laid out. We can start with one session and see how it goes from there. Build this Shaker-style step stool. These are group classes at the Cambridge Center For Adult Education, 42 Brattle St. in Harvard Square, Cambridge, MA. Over a period of 10 Saturday afternoons, you'll build the Shaker step stool shown above. Since this is a project-based class, you'll have a useful piece of furniture to take home at the end. Using only hand tools, you'll go from rough-milled lumber to a finished piece. Along the way you'll learn a variety of basic woodworking skills and traditional joinery techniques. Shaker styles make good introductory projects because they're practical, functional forms without being overwhelming. No experience, tools, or materials are required (though you're free to bring your own tools if you have some you'd like to use). 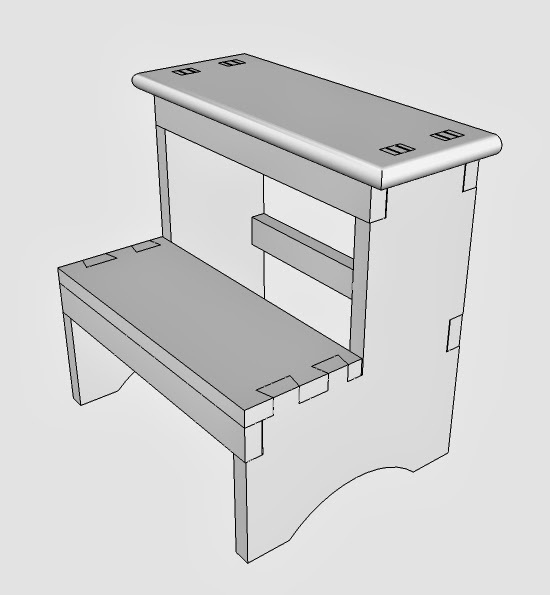 I'll supply everything you need to build the stool (there will be a $20 materials fee payable to me the first class). You'll learn what tools to use, how to handle them, and how to sharpen them so they work properly. 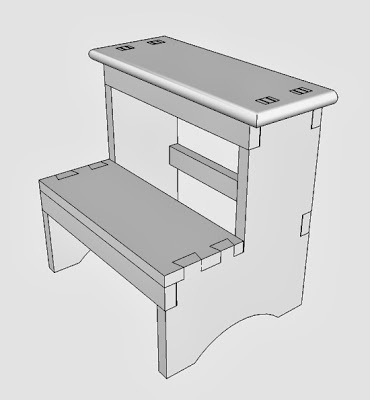 You'll learn construction techniques and the significance of grain orientation; for example, what does it mean that the wedges in the step stool top are parallel to the grain of the top? You'll also learn how to use the tools efficiently. People assume that hand tools are crude and slow, but once you develop the skills, they do the job quickly and accurately. People also assume they're hard to use. After all, didn't we invent power tools to make our lives easier? Yes, hand tools involve a little labor, but for single projects, it's not that difficult. Hand tools offer enormous satisfaction and joy working directly with your hands. The Shaker step stool form has been widely adapted, as you can see from a Google image search. The adaptation I've made is to mix both dovetail and mortise-and-tenon joinery. That means you'll come away with more skills. You can also customize the design a bit. These skills are applicable to a wide variety of woodworking projects, whether you're interested in furniture-, cabinet-, or instrument-making, boatbuilding, or general carpentry. Even if you prefer to work with power tools, hand tool skills can be invaluable. Buying guide: a quick primer on evaluating new and used hand tools. Sharpening: how to keep your saws, planes, and chisels working well. Handplaning: edge, face, and end planing. Simple joinery: edge-gluing, simple lap joints. Mortise and tenon: wedged through-mortise and tenon. Handsaws: rip saw, 26-28", 6ppi; crosscut saw, 26-28", 8ppi. Handplanes: #5 jack plane, #6 or 7 jointer, #3 or 4 smoother. Joinery backsaws: dovetail saw, 9", 15ppi (rip); rip and crosscut tenon saws, 12-16", 12-15ppi. Chisels: bevel-edge bench chisels in 1/4"-1" sizes. Marking: combination square, marking gauge, marking/chipcarving knife. 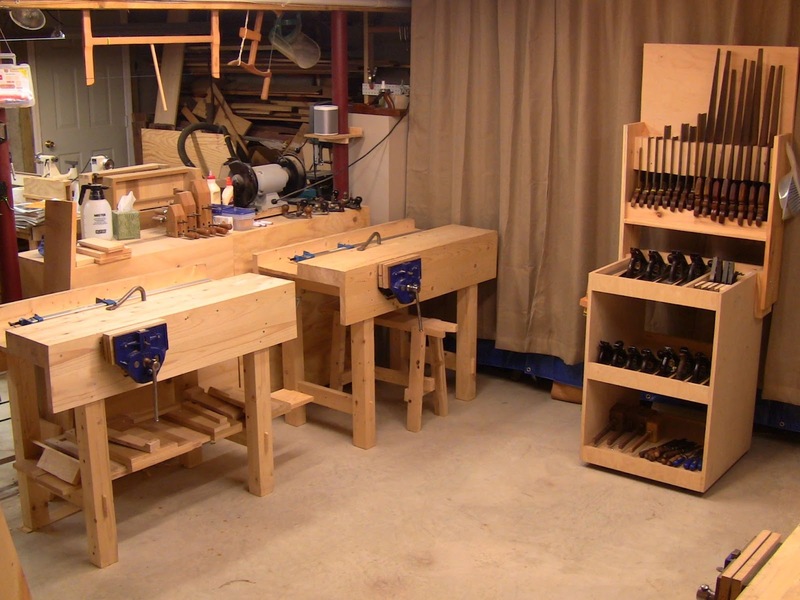 Bench appliances (shop-made): sawbench, winding sticks, benchhooks, shooting board. Note on buying new hand tools: in general, you get the quality (or lack of it) you pay for. You're better off in the long run paying for better quality. The one place where you can skip that advice is in the #5 jack plane, which we will use for roughing work; just about any old beater will do. Save your money on that one and put it in the other planes. You can also get by for a while with cheaper chisels. Used and antique tools are a more complicated story. For advice on buying new or old tools, see Chapter 4 of my free online course "Intro Hand Tools", The Tools. These are group classes at Woodcraft of Boston, 313 Montvale Ave., Woburn, MA. To sign up, contact the store at 781-935-6414, or email boston-retail@woodcraft.com. And if there are some specific classes you'd be interested in taking, it's worth contacting them and letting them know. Half the challenge of scheduling classes is knowing what people want to take.